Claude has been traveling with his wife for fifteen years, so speaks from experience. In order for anything to get done, you’ve got to do it. And the best laid plans often go awry. 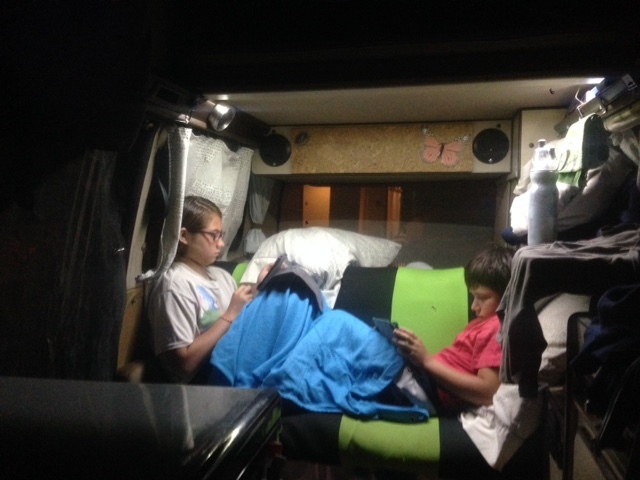 Before we set out on our trip, R and I had plans for driving, homeschooling, and exercise. You can read how the reality of our "road rules" clashed with our ideal here - in The Hardest Part - Driving. Part two of the series follows. Coconut and J relax before bed time with their screens - the scourge of the 21st century parent. Naively, R and I envisioned an idyllic experience where Coconut and J would willingly pull out their lessons on driving days, ask thoughtful questions about the Mayan ruins or other historical sites where we were picnicking, and pose for pictures to put in the photo journal they would make and treasure so much that they would ask to be buried with it. This ideal was based on past performance in a school room setting. Both Coconut and J are good students who are conscientious about their work and who get good grades. However, R and I have learned that this does not translate to being self-motivated homeschoolers. 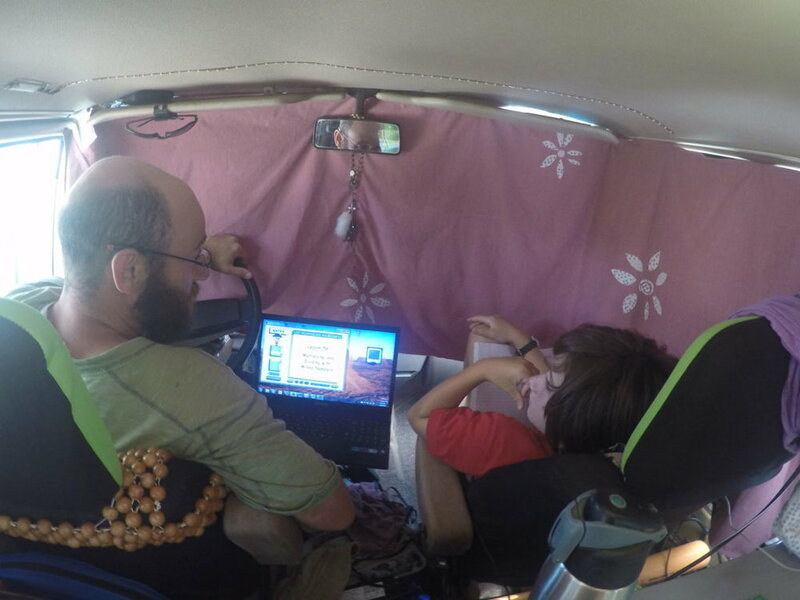 Rather than anything remotely resembling our ideal, we got constant conflict from Coconut and J about doing their self-directed math lessons on CD in the car (they both claim it gives them a headache). It wasn’t until I sat down with J to review each lesson with him that he finally began to show an inclination to achieve. As a consolation prize for my time lost, I learned how to multiply and divide fractions. Our 'classroom'. Homeschooling didn't always go as we planned. Lessons happened everywhere, including the common area of our hostels. This hostel in Santa Rosa, El Salvador was one of the best we'd stayed in. The only question either one of them ever asked at a ruin or museum was “When are we leaving?” As a variation, the other would ask, “How much longer?” Sometimes they would ask for ice cream. Coconut and J take a break from complaining to rest on the ruins at Palenque, Mexico. As for photos, we’ve taken a lot of them. Coconut is even in some, though usually she has her hand in front of the camera, warding-off-the-paparazzi-style. At the start, I had asked her to help me with selecting the photos to post with the blog entries. She picked her gaze up from her Kindle long enough to give me an incredulous look and never gave it a second thought. Even seeming fun things like bouncing around in the back of a tuk-tuk in Chichicastenango, Guatemala, can be boring to a moody teenager. So, for a while, whenever anyone asked us about homeschooling - and you would be surprised how many young, good-looking backpackers ask us about homeschooling - R and I would roll our eyes and tell them the truth. It was a complete failure. It was only recently when R and I started seriously talking about how we were going to convince ACPS that Coconut and J have showed “adequate evidence of educational progress” to move to the next grade that we realized things are not so bleak. We have done a lot of things and been to a lot of places, so, willingly or not, the kids have been exposed to a lot. It is hard to quantify what has been learned because this is not the traditional, formal schooling with which R and I are familiar. There are no test scores, book reports, or oral presentations to grade, and being products of the public school systems ourselves, I think this is what initially gave us pause. But, in retrospect, the exposure has resulted in absorption, which translates to learning. We started our year on the road by driving through the Deep South and visiting spots significant to the U.S. civil rights movement. In Atlanta we visited the Martin Luther King Jr. National Historic Site which includes the Ebenezer Baptist Church where he preached and his burial site and the Martin Luther King Jr. Center for Nonviolent Social Change. In Memphis, TN, we went to the Lorraine Motel where he was assassinated, and in Birmingham, AL, we visited the 16th Street Baptist Church, bombed in 1963, and killing four little girls. We also watched the movie Selma. Coconut has since compared the US civil rights movement to the continuing struggles of the indigenous peoples in Mexico and Central America. Family photo at the Lorraine Motel, Memphis, TN, site of Dr. Martin Luther King Jr.'s assassination in 1968. Visits to the Mayan cities of Palenque in Mexico and Tikal in Guatemala, as well as to other pre-hispanic sites, have introduced the kids to the existence and achievements of these cultures, as well as framed the impact the Spanish conquistadores had on their decline. J later recognized Monte Alban, a spectacular Zapotec ruin we visited which is situated on a plateau above the Oaxaca valley in Mexico, in the Jack Black movie “Nacho Libre.” Black, playing the character of a cook named Ignacio, takes a group of orphans to visit the site. “We’ve been there!” J shouted. “School of Rock” notwithstanding, who knew there could be anything of value in a Jack Black movie? J at Monte Alban, Mexico, where the ancient Zapotecs ruled Oaxaca's central valleys. This archeological site is also featured in the Jack Black movie, Nacho Libre. We’ve visited modern Mayan villages in the mountains of Chiapas state in Mexico and in Guatemala and seen the subsistence level existence the people endure. We’ve talked about their history and why streets are blockaded in protest for equal rights in land ownership and other basic human rights of which they have been robbed for centuries. Coconut’s year-long project will explore the causes of the revolutions that have impacted and shaped living conditions and economic opportunities in the countries we have visited. On Ometepe Island, Nicaragua, we had a chance to stay with a local family and experience cooking outdoors on wood fire and living in a square, brick house with dirt floors. The most spectacular natural phenomenon that we witnessed: a mass nesting of the Olive Ridley sea turtles in Playa la Escobilla, Oaxaca, Mexico. We’ve walked through rainforests, cloudforests, and jungles, and stood on beaches while tens of thousands of sea turtles arrived to nest in a spectacular natural phenomenon known as an arribata. Playa Esobilla, in Oaxaca State, Mexico, is one of the world's major nesting grounds for the olive ridley sea turtle. Once a month between September and January, hundreds of thousands of turtles come ashore to nest. We woke up before sunrise and were rewarded with witnessing thousands of sea turtles nesting and thousands more baby turtles hatching. The white objects in the photos are previously-lain eggs dug up by this nesting mama. We’ve visited animal rescue centers to understand how humans can impact these various ecosystems and affect the plants and animals that thrive there. In the wild we’ve seen howler monkeys, spider monkeys, and white-faced monkeys, huge flocks of noisy green parrots, several variety of toucans, all sizes of lizards, tarantulas, and geckos, dolphins, caimans and crocodiles, sloths and starfish. We know to watch out for scorpions in our shoes and which ant bites hurt the most. We searched for sharks in Lake Nicaragua but didn’t see any. At our campsite in Costa Rica, J watches a rescued sloth eat the hibiscus flowers he gathered for it. We’ve seen ten full moon cycles and watched the sky above Ometepe Island, Nicaragua, unblemished by a single light bulb for miles around and filled with more stars than we imagined existed (and satellites too). We’ve seen Jupiter and Mars and countless shooting stars. The full moon rises over the Catedral in Cordoba, Mexico just as it has done every cycle since 1688. And the Panama Canal? Forget about it. An entire years’ curriculum could be built around it alone. It’s rich in history, colonial-era and 20th century geopolitical intrigue, feats of medical science and modern engineering, and plays a major role in global commerce and economy. We learned that the size of the canal (110’ wide x 1000’ long) has determined the size of ocean vessels, which are built to fit through the canal and called “Panamax.” On the physical spectrum, traversing it as line handlers on a private boat introduced entry-level sailing skills like navigation and knot-tying. As a bonus, for those who meet the prerequisite (i.e., over age 21) there is a 400-level course in rum drinking with Captain Sandro. Going through the Panama Canal gave us each a chance to get behind the wheel of a sailboat. Understanding how the lock system works in the Panama Canal is more interesting when you are in the locks. Many of the people we have met have provided input as well. For the most part, they are young travelers who are excited to see Coconut and J having this experience and who teach lessons by words and actions - people who are leading bike tours, who are traveling after recovering from a serious accident, who volunteer time to help humans and/or animals in need, who have sold successful businesses, who have started successful businesses, who make chocolate or teach yoga or surf. Coconut and J's conversations with these adults are more meaningful than those they may have with adults at home about boring topics like school and sports. Coconut doesn't want to hear us tell her how to wash clothes on a pila, but she can see how it is done by helping a traveler who is living on $200 a month and has to wash her own clothes or have nothing clean to wear. J can't learn how to handle a machete from me, but willingly listens and watches others who have handled them for years. Coconut and J both appreciate advice from people who more clearly remember being 13 and can tell them to just ignore their parents and walk away when they do embarrassing things like sing and dance. We spent a week building this floating house in Costa Rica. We connected with Esteban and Tom via Workaway, an online community that connects volunteers with jobs in exchange for room and board. We’ve met people exploring the world in a lot of different ways and I think what I have learned is that Coconut and J don’t have to have the same dreams that I did when I was their age. There are a lot of options. And understanding that is the best education they can get.